At Raj Waterscape Properties Pvt. Ltd., we develop premium, exclusive and lifestyle oriented real estate projects with the calming influence of water as the central motif. Started in 2004, Raj Waterscape is ably assisted by its senior management. The team at Raj Waterscape comprises professionals with years of expertise and experience in varied fields. Raj Waterscape is promoted by Raj Holdings, a 3 decade old, multifaceted business conglomerate that has made an indelible impression across different industries, ranging from exports, real estate, print and media. 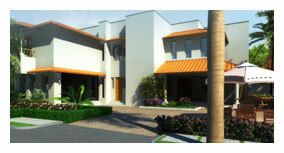 Buckingham Gardens is an upcoming premium lifestyle villa project on the scenic East Coast Road, Chennai. © Raj Waterscape Properties Pvt. Ltd.